New York is a state in the Mid-Atlantic and Northeastern regions of the United States of America. With 62 counties, it is the country's third most populous state. 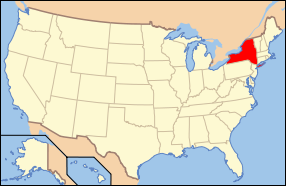 It is bordered by Vermont, Massachusetts, Connecticut, New Jersey, and Pennsylvania, and shares an international border with the Canadian provinces of Quebec and Ontario. Its five largest cities are New York City (also the largest city in the United States), Buffalo, Rochester, Yonkers, and Syracuse. New York was inhabited by Algonquian, Iroquois, and Lenape Native peoples at the time Dutch and French nationals moved into the region in the very early seventeenth century. First claimed by Henry Hudson in 1609, the region came to have Dutch forts in Fort Orange, present day Albany, NY, in 1614 and was colonized by the Dutch in 1624, at both Albany and Manhattan; it later fell to British annexation in 1664. About one third of all of the battles of the Revolutionary War took place in New York. The state ratified the United States Constitution in 1788, the 11th state to do so; its own constitution was enacted in 1777. New York covers 47,214 sq miles (122,284 km²). In size, New York ranks 27th compared with the other 50 states. The Great Appalachian Valley dominates eastern New York, while Lake Champlain is the chief northern feature of the valley, which also includes the Hudson River flowing southward to the Atlantic Ocean. The rugged Adirondack Mountains, with vast tracts of wilderness, lie west of the valley. Most of the southern part of the state is on the Allegheny plateau, which rises from the southeast to the Catskill Mountains, marking the southern edge of the Finger Lakes drainage area. The western section of the state is drained by the Allegheny River and rivers of the Susquehanna and Delaware systems. The Delaware River Basin Compact, signed in 1961 by New York, New Jersey, Pennsylvania, Delaware, and the federal government, regulates the utilization of water of the Delaware system. New York's borders touch (clockwise from the west) two Great Lakes (Erie and Ontario, which are connected by the Niagara River); the provinces of Ontario and Quebec in Canada; Lake Champlain; three New England states (Vermont, Massachusetts, and Connecticut); the Atlantic Ocean, and two Mid-Atlantic states (New Jersey and Pennsylvania). While the state is best known for New York City's urban atmosphere, especially Manhattan's skyscrapers, most of the state is dominated by farms, forests, rivers, mountains, and lakes. New York's Adirondack Park is larger than any U.S. National Park outside of Alaska. Niagara Falls, on the Niagara River as it flows from Lake Erie to Lake Ontario, is a popular attraction. The Hudson River begins with Lake Tear of the Clouds and flows south through the eastern part of the state without draining Lakes George or Champlain. Lake George empties at its north end into Lake Champlain, whose northern end extends into Canada, where it drains into the Richelieu and then the St Lawrence Rivers. Four of New York City's five boroughs are on the three islands at the mouth of the Hudson River: Manhattan Island, Staten Island, and Brooklyn and Queens on Long Island. The climate of New York State is broadly representative of the humid continental type, which prevails in the northeastern United States, but its diversity is not usually encountered within an area of comparable size. Masses of cold, dry air frequently arrive from the northern interior of the continent. Prevailing winds from the south and southwest transport warm, humid air, which has been conditioned by the Gulf of Mexico and adjacent subtropical waters. These two air masses provide the dominant continental characteristics of the climate. A third great air mass flows inland from the North Atlantic Ocean and produces cool, cloudy, and damp weather conditions. This maritime influence is important to New York's climatic regime, especially in the southeastern portion of the state, but it is secondary to that of the more prevalent air mass flow from the continent. The winters are long and cold in the Plateau Divisions of the state. In the majority of winter seasons, a temperature of -25°C or lower can be expected in the northern highlands (Northern Plateau) and -15°C or colder in the southwestern and east-central highlands (Southern Plateau). The Adirondack region records from 35 to 45 days with below zero temperatures in normal to severe winters. The summer climate is cool in the Adirondacks, Catskills, and higher elevations of the Southern Plateau. The New York City area and lower portions of the Hudson Valley have rather warm summers by comparison, with some periods of high, uncomfortable humidity. The remainder of New York State enjoys pleasantly warm summers, marred by only occasional, brief intervals of sultry conditions. Summer daytime temperatures usually range from the upper 70s to mid 80s (25 to 30 ˚C) over much of the State, producing an atmospheric environment favorable to many athletic, recreational, and other outdoor activities. The average length of the freeze-free season in New York State varies from 100 to 120 days in the Adirondacks, Catskills, and higher elevations of the Western Plateau Division to 180 to 200 days on Long Island. The important fruit and truck crop areas in the Great Lakes Plain enjoy a frost-free growing season of from 150 to 180 days in duration. A freeze-free season of similar length also prevails in the Hudson Valley from Albany southward to Westchester and Orange Counties, another zone of valuable crop production. The Southern Plateau, St. Lawrence Valley, and Lake Champlain regions have an average duration of 120 to 150 days between the last spring and first fall freezes. 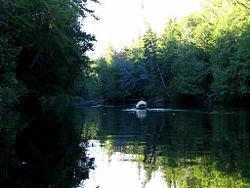 Long Pond in the Saint Regis Canoe Area of the Adirondack Park. 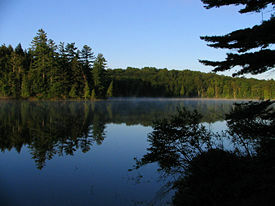 New York has many state parks and two major forest preserves. Adirondack Park, roughly the size of the state of Vermont and the largest state park in the continental United States at 2.8 million acres, was established in 1892 and given state constitutional protection in 1894. The thinking that lead to the creation of the Park first appeared in George Perkins Marsh's Man and Nature. published in 1864. Marsh argued that deforestation could lead to desertification]; referring to the clearing of once-lush lands surrounding the Mediterranean, he asserted "the operation of causes set in action by man has brought the face of the earth to a desolation almost as complete as that of the moon." The Catskill Park was protected in legislation passed in 1885, which declared that its land was to be conserved as wild forest lands and never put up for sale or lease. Consisting of 700,000 acres (2,800 km²) of land (half of which is public Forest Preserve), the park is a habitat for bobcats, minks and fishers. There are some 400 black bears living in the region. The state operates numerous campgrounds and there are over 300 miles (480 km) of marked and maintained multi-use trails in the Park. The Montauk State Park boasts the Famous Montauk Lighthouse commissioned by President George Washington in 1792, and is a major tourist attraction and is located in the township of East Hampton, Suffolk County. Also close by in Montauk, Hither Hills park offers camping and is a popular destination with surfcasting sportfisherman. The area was long inhabited by the Lenape. Lenape in canoes met Giovanni da Verrazzano, the first European explorer to enter New York Harbor, in 1524. Giovanni da Verrazzano named this place Nouvelle Angoulême (New Angouleme) in honor of the French king François I, Count of Angoulême. A French explorer and map-maker, Samuel de Champlain, described his explorations through New York in 1609. That same year Henry Hudson, an Englishman working for the Dutch, claimed the area in the name of the Netherlands. It was to be called New Amsterdam. 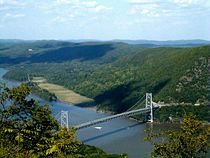 The Dutch, who began to establish trading posts on the Hudson River in 1614, claimed jurisdiction over the territory between the Connecticut and the Delaware Rivers, which they called New Netherlands. The government was vested in "The United New Netherland Company," chartered in 1614, and then in "The Dutch West India Company," chartered in 1621. The Hudson River has long been an essential transportation corridor for the state. The directors of the West India Company resented this attempt to shake their rule and wrote their director and council at New Amsterdam: "We have already connived as much as possible at the many impertinences of some restless spirits, in the hope that they might be shamed by our discreetness and benevolence, but, perceiving that all kindnesses do not avail, we must, therefore, have recourse to God to Nature and the Law. We accordingly hereby charge and command your Honors whenever you shall certainly discover any Clandestine Meetings, Conventicles or machinations against our States government or that of our country that you proceed against such malignants in proportion to their crimes." In 1663 the Duke of York purchased the grant of Long Island and other islands on the New England coast made in 1635 to the Earl of Stirling, and, in 1664, the Duke equipped an armed expedition, which took possession of New Amsterdam, which was thenceforth called New York, after the Duke. This conquest was confirmed by the treaty of Credo, in July 1667. In July 1673, a Dutch fleet recaptured New York and held it until it was restored to the English by the treaty of Westminster in February, 1674. The second grant was obtained by the Duke of York in July, 1674 to perfect his title. The original grants are in the New York state Library. New York was established by its colonial charter. This constitution was framed by a convention which assembled at White Plains, New York on July 10, 1776, and after repeated adjournments and changes of location, terminated its labors at Kingston, New York on Sunday evening, April 20, 1777, when the constitution was adopted with but one dissenting vote. It was not submitted to the people for ratification, and was drafted by Colonel John Jay. On July 9, George Clinton was declared elected and he was inaugurated as Governor at Kingston on July 30, 1777. Albany became the capital of the State in January 1797. 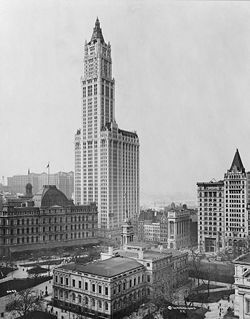 The Woolworth Building, in New York City, was one of the world's first skyscrapers (1913). The colonial charter of New York granted unlimited westward expansion, despite Native American presence in the Area. Massachusetts' charter had the same provision, causing territorial disputes between the colonies and with the Iroquois. During the revolution, four of the Iroquois nations fought on the side of the British, with one exception, the Oneidas. In 1779, Major General John Sullivan was sent to defeat the Iroquois. The Sullivan Expedition moved northward through the Finger Lakes and Genesee Country, burning all the Iroquois communities and destroying their crops and orchards. Homeless now, in their own land, the Indians marched to Niagara, where, around the fort the English built huts for them to pass the winter in. Owing to the severe cold, hunting became impossible that season; so that they were forced to live on salted food, which produced scurvy, and hundreds of them died. After the war, many moved to Canada. The creation of the Erie Canal led to rapid industrialization in New York. 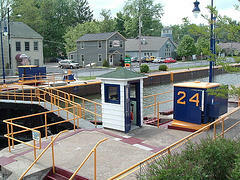 Transportation in western New York was difficult before canals were built in the early part of the nineteenth century. The Hudson and Mohawk Rivers could be navigated only as far as Central New York. While the St. Lawrence River could be navigated to Lake Ontario, the way westward to the other Great Lakes was blocked by Niagara Falls, and so the only route to western New York was over land. Governor DeWitt Clinton strongly advocated building a canal to connect the Hudson River with Lake Erie, and thus all the Great Lakes. Work commenced in 1817, and the Erie Canal was finished in 1825 and was replaced by the Barge Canal in 1918; and the system of waterways was further expanded by the construction of the St. Lawrence Seaway. The canal opened up vast areas of New York to commerce and settlement, and enabled port cities such as Buffalo to grow and prosper. The Welland Canal was completed in 1972. Iroquois, in Buffalo, New York, 1914. New York State has had five constitutions, adopted in 1777, 1821, 1846, 1894, and 1938. Under its present constitution (adopted in 1938), New York is governed by three branches of government: the executive branch, consisting of the Governor of New York and the other independently elected constitutional officers; the legislative branch, consisting of the bicameral New York State Legislature; and the judicial branch, consisting of the state's highest court, the New York Court of Appeals, and lower courts. The state has two U.S. senators, 29 members in the United States House of Representatives, and 31 electoral votes in national presidential elections (a drop from its 41 votes during the 1970s). New York's capital is Albany. The state's subordinate political units are its 62 counties. Other officially incorporated governmental units are towns, cities, and villages. New York has more than 4,200 local governments that take one of these forms. About 52 percent of all revenue raised by local governments in the state is raised solely by the government of New York City, which is the largest municipal government in the United States. Many of New York's public services are carried out by public benefit corporations, frequently called authorities or development corporations. Well-known public benefit corporations in New York include the Metropolitan Transportation Authority, which oversees New York City's public transportation system, and the Port Authority of New York and New Jersey, a bi-state transportation infrastructure agency. New York State consistently supports candidates belonging to the Democratic Party in national elections. Democratic presidential candidate John Kerry won New York State by 19 percentage points in 2004, while Democrat Al Gore won the state by an even larger margin of 25 percentage points in 2000. New York City is a major Democratic stronghold with liberal politics. 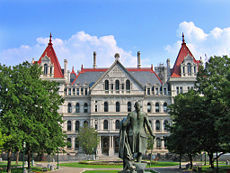 Many of the state's other urban areas, including Albany, Ithaca, Buffalo, Rochester, and Syracuse are also Democratic. Suburban areas and rural upstate New York, however, are generally more conservative than the cities and tends to favor Republicans. Heavily populated suburban areas such as Westchester County and Long Island have swung between the major parties over the past 25 years and often have tightly contested local elections. New York City is the most important source of political fund-raising in the United States for both major parties. Four of the top five zip codes in the nation for political contributions are in Manhattan. The top zip code, 10021 on the Upper East Side, generated the most money for the 2004 presidential campaigns of both George Bush and Al Gore. Republican Presidential candidates will often skip campaigning in the state, taking it as a loss and focusing on vital swing states. 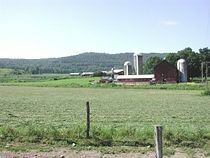 A dairy farm near Oxford, New York. 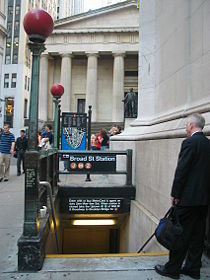 The New York City subway is the largest mass transit system in the world by number of stations. The Bear Mountain Bridge crossing the Hudson River. New York's agricultural outputs are dairy products, cattle and other livestock, vegetables, nursery stock, and apples. New York's industrial outputs are printing and publishing, scientific instruments, electric equipment, machinery, chemical products, and tourism. Canada is a very important economic partner for the state. Twenty-three percent of the state's total worldwide exports went to Canada in 2004. Tourism from the north is also a large part of the economy. Canadians spent US$487 million in 2004 while visiting the state. The state also has a large manufacturing sector that includes printing and the production of garments, furs, railroad equipment and bus line vehicles. Many of these industries are concentrated in upstate regions. Albany and the Hudson Valley are major centers of nanotechnology and microchip manufacturing, while the Rochester area is important in photographic equipment and imaging, including such companies as Bausch and Lomb, Eastman Kodak, and Ilex. New York is a major agricultural producer, ranking among the top five states for agricultural products including dairy, apples, tart cherries, cabbage, potatoes, onions, maple syrup, feed grains, and many others. The state is the second largest producer of cabbage in the United States. The state has about a quarter of its land in farms, totaling around 7,596,000 acres, and produced $3.6 billion (in U.S. dollars) in agricultural products in 2005. The south shore of Lake Ontario provides the right mix of soils and microclimate for many apple, cherry, plum, pear and peach orchards. Apples are also grown in the Hudson Valley and near Lake Champlain. The south shore of Lake Erie, the Hudson Valley, the eastern end of Long Island and the southern Finger Lakes hillsides are the four major producing areas with vineyards. New York is the nation's third-largest grape-producing state, behind California and Washington, and second largest wine producer by volume. In 2005, New York's wine and grape industry brought $34.3 million worth of crops into the state economy. The state has 33,692 acres of vineyards with 270 wineries in 2006, and produced 200 million bottles of wine in 2006. A moderately sized saltwater commercial fishery is located along the Atlantic side of Long Island. The principal catches by value are clams, lobsters, squid, and flounder. A state and local highway system that annually handles over 100 billion vehicle miles. This total system encompasses more than 113,000 highway miles and more than 16,000 bridges. An extensive 4,600-mile rail network over which 42 million tons of equipment, raw materials, manufactured goods and produce are shipped each year. 513 public and private aviation facilities through which more than 31 million people travel each year. Five major ports which annually handle 50 million tons of freight. 12 major public and private ports which handle more than 110 million tons of freight annually..
New York City is home to the most complex and extensive transportation network in the United States, with more than 13,000 iconic yellow cabs, 120,000 daily bicyclists, a massive subway system, bus and railroad systems, immense airports, landmark bridges and tunnels, ferry service and even an aerial commuter tramway. MTA subways, buses and railroads move about 2.4 billion New Yorkers a year - about one in every three users of mass transit in the United States and two-thirds of the nation's rail riders live in New York and its suburbs. Besides New York City, many of the other cities have urban and regional public transportation. Syracuse is the smallest city in the U.S. to have a commuter rail line, known as OnTrack. Buffalo also has a Subway line, sometimes called a Lightrail System run by the Niagrara Frontier Transportation Authority, and Rochester had a subway system from 1927-1957, although it is mostly filled in or left abandoned. Only a small part exists under the old Erie Canal Aqueduct near City Hall was still used for paper deliveries up until as recently as 1996. Public secondary education in the state consists of high schools that teach elective courses in trades, languages, and liberal arts with tracks for gifted, college-bound and industrial arts students. New York is one of seven states that mandates the teaching of Holocaust and genocide studies at some point in elementary or secondary school curricula. Butler library at Columbia University in New York City the wealthiest university in the state of New York. New York's statewide public university system is the State University of New York (SUNY) which hosts top flight schools such as Binghamton University, Stony Brook University, SUNY Fredonia, and SUNY Geneseo. With a total enrollment of 413,000 students and 1.1 million continuing education students spanning 64 campuses across the state, SUNY is the largest public university system in the United States. The City University of New York (CUNY) is the public university system of New York City and is independent of the SUNY system. It is the largest urban university in the United States, with 11 senior colleges, 6 community colleges, a doctorate-granting graduate school, a journalism school, a law school and the Sophie Davis School of Biomedical Education. More than 450,000 degree-credit, adult, continuing and professional education students are enrolled at campuses located in all five New York City boroughs. New York is also home to such notable private universities as Columbia University, Vassar College, Colgate University, New York University, Rensselaer Polytechnic Institute, Rochester Institute of Technology, the University of Rochester, and Syracuse University. New York has hundreds of other private colleges and universities, including many religious and special-purpose institutions. The state's land-grant university is Cornell University, a private university. Two of the nation's five Federal Service Academies are located in New York: The United States Military Academy at West Point and the United States Merchant Marine Academy at Kings Point. New York is the nation’s largest importer of college students, according to statistics which show that among freshmen who leave their home states to attend college, more come to New York than any other state, including California. As of 2006, New York was the third largest state in population after California and Texas, with an estimated population of 19,306,183. This represents an increase of 329,362 or 1.7 percent, since the year 2000; it includes a natural increase since the last census of 601,779 people (1,576,125 births minus 974,346 deaths) and a decrease due to net migration of 422,481 people out of the state. Immigration internationally resulted in a net increase of 820,388 people, and migration within the country produced a net loss of about 800,213. New York is a slow growing state with a large rate of emigration to other states, having the largest state-to-state flow to Florida, followed closely by the rate of migration to New Jersey. New York state is a leading destination for international immigration, however. The center of population of New York is located in Orange County, in the town of Deerpark. New York City has a population of 8,008,278 people, which is about 41.48 percent of the state's population. The major ancestry groups in New York state are Italian (14.4 percent), Irish (12.9 percent), and German (11.2 percent) . According to a 2006 estimate, 21.6 percent of the population is foreign-born. New York is home to the largest Dominican population in the United States, but there has been a significant spread to other states in the last decade. The state of New York was host to 617,901 Dominicans in 2000. The New York City neighborhood of Harlem has historically been a major cultural capital for African-Americans. Queens, also in New York City, is home to the state's largest Asian-American population. In the 2000 Census, Italian-Americans make up the largest ancestral group in Staten Island and Long Island, followed by Irish-Americans. 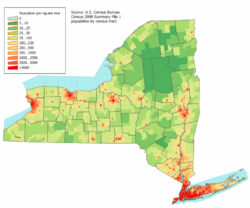 Albany and southeast-central New York are heavily Irish-American and Italian-American. In Buffalo and western New York, German-Americans are the largest group; in the northern tip of the state, French-Canadians. According to the 2000 U.S. Census, 13.61 percent of the population aged 5 and over speak Spanish at home, while 2.04 percent speak Chinese (including Cantonese and Mandarin), 1.65 percent Italian, and 1.23 percent Russian. Catholics comprise more than 40 percent of the population in New York.. Protestants are 30 percent of the population, Jews 5 percent, Muslims 3.5 percent, Buddhists 1 percent, and 13 percent claim no religious affiliation. 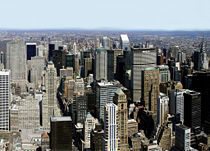 The largest city in the state and the most populous city in the United States is New York City, which is comprised of five boroughs (the Bronx, Manhattan, Queens, Brooklyn, and Staten Island), however the Big Apple spans five counties as well (New York, Kings, Queens, Bronx, Richmond). These counties, however, are unlike the other 57 in that they no longer have separate "county services" nor do they have county seats. New York City is home to more than 40 percent of the state's population. Buffalo is the second largest city in the state. Albany is the state capital, and the Town of Hempstead is the civil township with the largest population. The southern tip of New York State—New York City, its suburbs including Long Island, the southern portion of the Hudson Valley, and most of northern New Jersey—can be considered to form the central core of a "megalopolis," a super-city stretching from the northern suburbs of Boston to the southern suburbs of Washington D.C. in Virginia and therefore occasionally called "BosWash." First described by Jean Gottmann in 1961 as a new phenomenon in the history of world urbanization, the megalopolis is characterized by a coalescence of previous already-large cities of the Eastern Seaboard: a heavy specialization on tertiary activity related to government, trade, law, education, finance, publishing and control of economic activity; plus a growth pattern not so much of more population and more area as more intensive use of already existing urbanized area and ever more sophisticated links from one specialty to another. Several other groups of megalopolis-type super-cities exist in the world, but that centered around New York City was the first described and still is the best example. Baseball is the city's most closely followed sport. There have been fourteen World Series championship series between New York City teams, in matchups called Subway Series. New York is one of only three cities (Chicago and Los Angeles being the others) to have two baseball teams. The city's two current Major League Baseball teams are the New York Yankees and the New York Mets. The city also was once home to the New York Giants (now the San Francisco Giants) and the Brooklyn Dodgers (now the Los Angeles Dodgers). Both teams moved to California in 1958. There are also two minor league baseball teams in the city, the Staten Island Yankees and Brooklyn Cyclones. The New York Rangers represent the city in the National Hockey League, calling Madison Square Garden home. In soccer, New York is represented by the Major League Soccer side, Red Bull New York. The "Red Bulls" also play their home games at the Giants Stadium in New Jersey. The New York City Marathon is the largest marathon in the world. The city's National Basketball Association team is the New York Knicks and the city's Women's National Basketball Association team is the New York Liberty. The first national college-level basketball championship, the National Invitation Tournament, was held in New York in 1938 and remains in the city. Rucker Park in Harlem is a celebrated court where many professional athletes play in the summer league. ↑ State Symbols USA, New York State Motto Retrieved February 16, 2012. ↑ Land and Water Area of States (2000). Infoplease.com. Retrieved April 11, 2008. Note: This area is based on U.S. Census Bureau figures. Other sources such as The World Almanac and the Rand McNally World Atlas use an area of 49,576 square miles (128,400 km²), which would rank the state 30th. ↑ The Climate of New York. Cornell University. Retrieved November 12, 2007. ↑ A Political History of the Adirondack Park and Forest Preserve. Adirondack-Park.net. Retrieved November 12, 2007. ↑ New York State Facts: New York State History, New York State Department of State. Accessed December 3, 2007. "It was conquered by the English in 1664 and was then named New York in honor of the Duke of York." ↑ Yorks of the World, City of York (England) Tourism Bureau. Accessed July 3, 2007. "The most famous of York’s descendants, New York state and city were both renamed when the British captured what was then a Dutch colony known as New Netherland (and its city New Amsterdam) in 1664. James Duke of York, brother of King Charles II, became the proprietor of the colony and so it was that the state and the city become called New York." ↑ 2006 Annual Report on Local Governments. Division of Local Government Services and Economic Development. Retrieved December 28, 2007. ↑ Election Overview: Top Zip codes. OpenSecrets.org. Retrieved December 28, 2007. ↑ History: Past & Present. NYSDot.Gov. Retrieved December 27, 2007. ↑ About TLC. New York City Taxi & Limousine Commission. Retrieved December 27, 2007. ↑ Biking It. Gotham Gazette. Retrieved December 27, 2007. ↑ The New York Observer. July 23, 2006. Editorials, New York, College Town Retrieved December 30, 2007. ↑ Population and Population Centers by State: 2000. U.S. Census. Retrieved December 19, 2007. ↑ Profile of Selected Social Characteristics. U.S. Census Bureau. Retrieved December 19, 2007. ↑ [http://www.earthinstitute.columbia.edu/cgsd/advising/documents/rivera_batiz.pdf Dominicans In The United States: A Socioeconomic Profile, 2000]. Earth Institute. Retrieved December 19, 2007. ↑ MLA Language Map Data Center. MLA Language Map Data Center. Retrieved December 19, 2007. ↑ American Religious Identification Survey(Key Findings). American Religious Identification Survey. Retrieved December 19, 2007. ↑ The Upstate N.Y. Roads Site. The Upstate N.Y. Roads Site. Retrieved September 4, 2007. ↑ New York Geography. New York Yankees Info. Retrieved December 28, 2007. This page was last modified on 20 November 2018, at 16:15.